Cosmoteer 0.13.6 - Explosive Charges, Multiplayer A.I., and more! For a while now, Cosmoteer has supported a feature allowing you to self-destruct literally any module on your ship at any time. To be honest, I've always thought this was pretty strange, and in multiplayer it's especially exploitable. So I decided to remove arbitrary self-destruct of individual modules. However, players were using the self-destruct to execute some pretty creative strategies (such as splitting ships into multiple distinct ships), and I didn't want to lose those creative strategies altogether -- I just wanted a way to balance them and make them feel less strange. While fairly cheap, the Explosive Charge is still much more expensive than a single structure tile (which is what players would usually use to self-destruct in previous versions) and so you must balance its cost against other modules. Additionally, since the Explosive Charge will also destroy almost everything else around it, you'll need to position it carefully to make sure that its explosion won't damage other important parts of your ship. In order to round-out uneven teams in multiplayer or play co-op against the computer, the host of a multiplayer game can now add A.I. players. These are just like regular players, except that their ships are controlled by the computer. 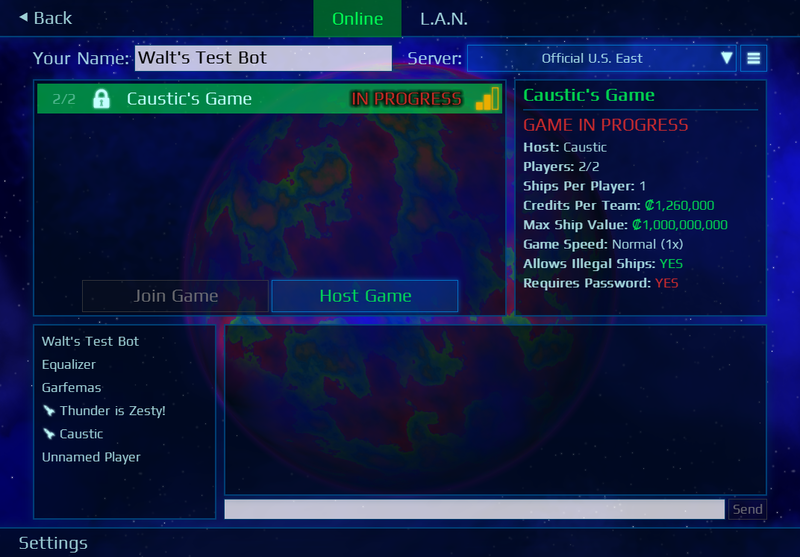 The host is able to select the difficulty level of the A.I. and what ships it will use. This update also has a plethora of quality-of-life improvements to make multiplayer more playable and stable. First of all, the networking code has been significantly optimized and should now have fewer disconnects, fewer server crashes, lower latency, and use less bandwidth. That's a win all-around! Notice that there's also a little latency meter displayed for every game that should give you a rough indication of how laggy the game will be. Third, due to past problems with spam, this update now limits chat messages in the public lobby to 5 every 50 seconds. You can also mute individual players and ban them altogether from joining your games. Lastly, this update adds a toggle to the in-game chat that lets you send messages that can be seen by only your teammates, so you can strategize without informing the enemy of your plans! This update has a ton more improvements and bug fixes. Check out the full changelog for all the details!